Did you know in Spanish, 'tonto' means stupid? The stories of the failure of The Lone Ranger have now become legendary. The film (and its commercial and especially, critical, failure) has become notorious, and the stars and producer's blaming yours truly for its artistic and commercial failure will only add to its infamy. I might tackle the controversy over the critical reaction to The Lone Ranger at another time (when the demands of both full-time work and graduate school permit). For now, let us turn to the film itself. I will grant that perhaps some of my brethren may have gone overboard in their hatred for The Lone Ranger. It is not the unmitigated disaster it has been made out to be (it certainly is far better than other films released this year, such as After Earth or The Host). 'Better', however, is a relative term, for The Lone Ranger is confused about what it wants to be, which may explain its completely incomprehensible running time and meandering story and shifts in tone, not to mention its framing device and leaps of logic and plot holes. It is San Francisco, 1933. A little boy in a Lone Ranger costume wanders into a Wild West exhibit, where among the artifacts is "The Noble Savage: In His Natural Habitat". As he stares, the 'noble savage' comes to life. The 'noble savage' is temporarily stunned to see "Kemosabi" in miniature form. Yes, this 'noble savage' is none other than Tonto (Johnny Depp), who now regales the boy with the story of The Lone Ranger. Now we go to Texas, 1869. John Reid (Armie Hammer), a bookish lawyer, is returning to Texas after obtaining his law degree. Also aboard the train are two criminals: Butch Cavendish (William Fichtner), notorious bandit, and Tonto. There is a daring escape aboard, and somehow in all that John manages to bungle both his attempt to stop the escape and Tonto's quest to kill Butch (for reasons to be explained later). Still, they all manage to arrive in Colby, where John's more competent brother Dan (James Badge Dale) is a Ranger. Also there is his wife Rebecca (Ruth Wilson) and their son Danny (Bryant Prince). With Cavendish out on the loose a posse is organized, and bumbling John is deputized. It isn't long before the posse is ambushed by Cavendish and his gang, having been led astray by one of the posse, and killed off (Cavendish, it is understood, ate a bit of Dan's heart). Tonto, whose escape from prison is never explained, comes across the posse and starts burying them. However, a beautiful white horse which Tonto interprets as a spirit horse comes upon the remains and selects John. Despite his misgivings, Tonto brings John (who is merely wounded) along. From there, Tonto advises this 'spirit walker' (one who cannot be killed) to wear a mask and pursue Cavendish. Somehow in all this, they deal with Red (Helena Bonham Carter), a one-legged madam whose prosthetic leg is not only made of ivory but wields a shotgun, we find that Rebecca & Danny (having been abducted by fake Comanche to start a war that will allow the railroad company to steal their land (making the rescue vital to John, since both still carry feelings for each other), and that Cavendish not only has done evil to Tonto's people but that Cavendish has also something to do with evil train baron Latham Cole (Tom Wilkinson). If there is anything to fault in The Lone Ranger, it is that it simply has no idea what it wants to be. The synopsis I have given is a remarkably simple description of the overall film, which meanders all over the place, going through various plots and subplots that don't add anything to the story presented. Take the subplot of John and Rebecca's romance. I imagine this was to give John some motivation to rescue, maybe even go to dark places the squeaky-clean John could go in his quest for either rescue or revenge. However, while it does perversely bring memories of story threads from The Searchers (hidden feelings between a man and his sister-in-law, kidnapped niece/nephew), in The Lone Ranger it seemed to be there only to have ANY type of 'love interest'. One might have thought the saving of the family would have been enough, but we have to throw in some vague romance that A.) doesn't add anything to the actual film, and B.) seems to be there for the hoped-for sequel. Then we have the actual framing device of having an old Tonto tell his story. Why is this there at all? Just when there is a possible chance to get some momentum going, we are dragged back to the 1933 part, which really offers no reason to be there. There are a whole host of things that The Lone Ranger doesn't seem to care about answering. A primary issue is its length. At nearly two-and-a-half hours, we are actually given so many stories that if there had been a focus on one of them, we could have had a respectable film. Instead, we get the Cavendish story AND the Cole story all colliding with each other (no pun intended). Even worse, both stories are brought together in the most ludicrous fashion, one that is simply too dumb to believe. Terry Rossio, Ted Elliott, and Justin Haythe give us situations and characters that don't add up to whatever story they want to tell us. Take Bonham Carter's character. She isn't a major part of the story as a whole (I think the traitor visits her brothel and Cavendish cost Red her ballet leg), but that isn't the character's major problem. It's said prosthetic leg, one that for perhaps really bizarre reasons arouses Captain Fuller (Barry Pepper, adding another embarrassment to his Emmy-winning career). And even if we have an ivory prosthetic leg, does it really have to fire shots? Wouldn't making Red an Annie Oakley-type be more...well, sane? It seemed that The Lone Ranger was determined to make one bad decision after another. Why did they opt to make John Reid such a bumbling wimp? Why did Tonto speak in stereotypical pidgin English when all the other Native American characters we see (such as Saginaw Grant's Chief Big Bear) speak English perfectly? This more than any other aspect belies the idea that Johnny Depp and director Gore Versinski were going to make this version of Tonto a more respectable one. Depp stuck with the traditional interpretation of the Native American character speaking in broken English. That is already bad enough, but his various actions (such as his constant feeding of the bird headdress he has) make him look borderline nuts. Yes, we do have a reason given somewhere past the midpoint of the film that gives some explanation of his odd behavior, but it still doesn't make the playing of Tonto any more agreeable. This is even worse when you consider that basically, Tonto is the star of The Lone Ranger. I imagine this is because Depp is the bigger star, but Depp is doing the same schtick he's done before in the Pirates of the Caribbean films, in Charlie & The Chocolate Factory, and even Dark Shadows. The weirdness factor has grown stale, and now we have a rather thin layer of stereotype to add to the mix. I don't fault Hammer in his performance. He seems to be in a comedy because when even the situation appears to call for gritty action his John Reid still plays to be the slightly bumbling city lawyer (such as whenever he puts up his dukes). Given this, his shift to action hero who can ride his steed on top or runaway trains and catch bullets thrown at him with the greatest of ease is left unexplained. Hammer seems to understand at least the idea that there needs to be a lighter tone, but the constant humiliations Reid undergoes (such as being dragged through horse manure) doesn't help to make John Reid more heroic. It defies understanding as to why Reid was made for most of the film such a blithering wimp. Then again, explanations and logic are not The Lone Ranger's strongpoints. 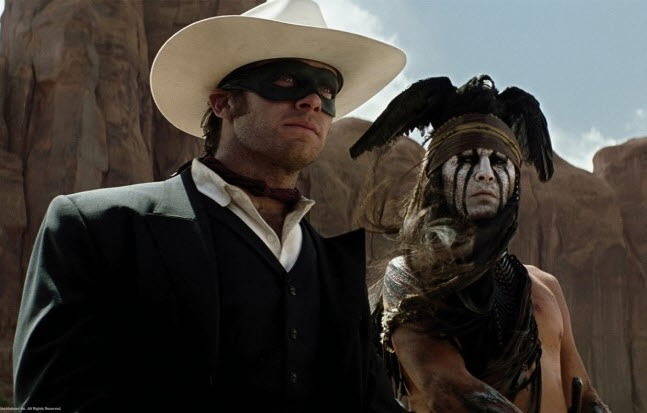 The Lone Ranger is monstrously long, more a sign of its inability to decide what it wanted to be (buddy comedy, straight-on action film, spoof, franchise launcher) and its inability to tell one story (instead throwing in a great deal that is superfluous or mere intro to some idea of sequels). In terms confusing and confused, about the only things that keep it bearable are one or two train sequences that are well-filmed, keeping some balance between action and comedy. 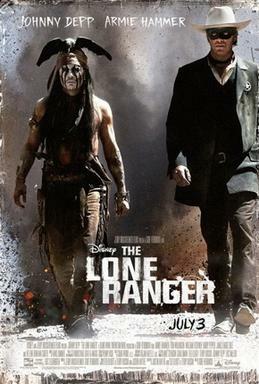 However, with its sprawling story (or strange mishmash of various stories), feats of illogic (the framing device, a cavalry charge that somehow manages to never hit Reid or Tonto who were buried up to their necks), and wild shifts in tone (from cannibalism to goofy stunts), The Lone Ranger is not a disaster...but it is a mess. 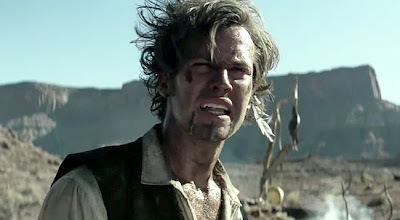 While I found the Lone Ranger to be a fun and entertaining ride, it was certainly a dumb one. It is one of the movies that I enjoyed, but agree with most of the criticisms about the movie. If the annoying narrative device of the old Tonto telling the kid the story was removed, it would have greatly aided the film's runtime and pacing. I probably enjoyed it than I would have otherwise because a couple of my friends and I watched together, therefore that made the experience more enjoyable.